This is a post I couldn’t write a few years ago. Back then, I had just started sharing my work with others. Although I desperately needed feedback, sometimes it hurt. Sometimes the criticisms made me doubt. And sometimes those criticisms made me change my stories, for better andworse. But it doesn’t change the fact that feedback is a necessary evil in writing. That first project? You know the one. The story that started them all, the one you’ll see through the bitter end, and the one you fear will end up in the bottom of the desk drawer. That one—your baby. Feedback on that story is always the hardest. There’s no way around that, unless you have a Teflon-coated ego (and if you have one of those maybe you shouldn’t writing). You put so much of yourself into that first book, your dreams and hopes that you’ll buck the trend and get on the NY Times bestseller list. Any critical feedback will seem like an indictment against all that labor and love. But if you’re writing for publication, you’ll get over that eventually. You’ll have to. Along with revising and revising some more until it’s time to start the feedback cycle all over again. It’ll go easier the second time around. After all, you already understand how it works. You have a stronger sense of your story’s strengths and weaknesses, and perhaps more importantly, you’ll understand yourself better. Which means knowing when you are overreacting to a piece of criticism and knowing which suggestions you need to consider and which ones you need to ignore. This is a huge milestone, but it takes practice with the feedback cycle, and sometimes a strong understanding of the people reading your work. It takes time to do this. But it’s time well spent, because you need to get all this out of your system in order to start on the next project, regardless of whether your baby sells. With the next project, you’ve told yourself you’re not going to make the same mistakes as the first. And you won’t—you’ll just make different ones. And then the feedback circuit will give you time to fix them. It’ll be even easier this time. You know why? Because you don’t have nearly the same emotional investment in this project as you did in the one before. I’m not saying you don’t care about this project—you most certainly do. But now you know that this project isn’t the be-all and end-all of your writing career. You have other stories in you. This new story proves it. So feedback this time may still sting, but you’ll be better able to compartmentalize it and use it to fuel positive changes in your work. And this is hugely valuable when you’re faced with tough revision decisions like restructuring your novel, adding or subtracting characters, or simply gutting the story and starting all over again. The hard work that maybe you weren’t strong enough to even consider with your baby. But now, when the hunger for getting published—getting out there—when you have enough confidence in your craft that it’s just a matter of the right story hitting at the right time? Yeah, that. That’s when the tough decisions get made. The more you write, the more mistakes you get to learn from. The more mistakes you learn from, the more viable stories you create. The more viable stories, the easier it is to deal with feedback. Why? Because you can be more objective about your work. Because you no longer have the one story to care about, you have other projects now. All that emotion, good and bad, gets distributed across them. The successes and failures of individual projects gets muted, which makes it easier to make objective decisions how to manage them. It’s a good thing, I think. It’s just important stay engaged, move forward, and above all, keep writing. 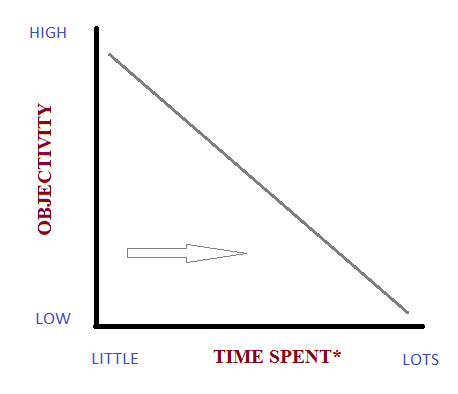 In my experience, my objectivity is reduced the longer I spend working on something. Tunnel vision is inevitable—that’s why it’s so important to take a break from your projects every now and then to gain perspective. It’s also why you need other readers. But at the very least, if you keep writing, the less likely you’ll fall into the trap you did when writing your baby. Good points here. I think feedback gets easier also because you start to learn what to expect and you undertand that a reader's comments do not mean they hate your writing. 🙂 The toughest critiques I receive are from those that love my work most. You also had an excellent point about knowing your readers. In feedback, so much is subjective, and knowing where a reader is coming from personally can shed a lot of light on their comments. I'm glad feedback is working for you, Blue. As a datapoint, I'll mention that I don't get crits on my stories. I reckon I'm odd that way.